There was no shortage of melanin-deficient people wringing their pasty hands over comedian Michelle Wolf’s speech at the White House Correspondents’ Dinner this weekend. Wolf minced no words when addressing the Trump administration’s cadre of complicit white women; she also skewered the press, pointing out the ways that journalists and media institutions have built their reputations and profited off President Donald Trump’s divisive politics. Because of this, Wolf’s no-holds-barred speech ended up uniting a delegation of reporters, administration officials and quasi-professional concern trolls in a rancid mayo mélange of righteous outrage. But coming to Wolf’s defense were people with good sense (aka people who season their meat), including a number of comedians, such as Jimmy Kimmel, Seth Meyers and Dave Chappelle. 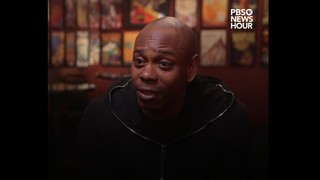 In an interview Monday on PBS NewsHour, Chappelle told interviewer Jeffrey Brown that he “really respected” Wolf’s routine. “Cathartic” is right. Wolf, a white woman, understood that punching up included calling out not just Trump—a predictable and easy target—but also the white women and the media that have propelled and projected his harmful views and policies. Chappelle went on to point out that there was an “enormous amount of levity” and truth to Wolf’s speech, and he expressed admiration for her refusal to pander to the audience.